1) Grant of License: The purchase of this software grants to you ("user") as licensee, the non-exclusive right to use and display the software at a single home or business location on a maximum of 5 CPUs. You also may give a copy of this software to any service bureau which you hire to output your film, paper or color proofs, provided that they do not use the font software for any purpose other than outputing your work. They may keep the font software on file for use with future jobs on your behalf. 2) Backup: One copy of the software may be made for backup. 3) Transfer: You may transfer the original software from one party to another provided ALL materials, including all backup copies are included and that the recipient agrees to the licensing terms and conditions. 4) Copyright: The software and accompanying documentation are copyrighted and contain intellectual property information protected by law. You may not make or distribute copies of this software or accompanying documentation without the express written consent of Fonthead Design. 5) Fair Use: If there are illustrations or images in the font software other than letterforms, numbers, punctuation marks, diacritics, etc, you may NOT use the font software in a manner where the illustration or image becomes the primary aspect of a product for resale. For example, if an image was used on a coffee cup, to sell the coffee cup, or on a t-shirt to sell the t-shirt or on a greeting card to sell the greeting card, etc. 6) Ownership of software: The software and all subsequent copies are the property of Fonthead Design. This does not apply to the physical media on which the software is contained. 7) Disclaimer and Limited Warranty: Fonthead Design warrants that the disk is free of errors and will be replaced within one year of purchase in the event of defective media. If the failure of disk results from accident, abuse, or neglect, then Fonthead Design assumes no responsibility to replace the disk. THE SOFTWARE AND ACCOMPANYING WRITTEN MATERIALS ARE PROVIDED "AS IS" WITHOUT WARRANTY OF ANY KIND, EXPRESSED OR IMPLIED, AND FONTHEAD DESIGN SPECIFICALLY DISCLAIMS THE WARRANTIES OF FITNESS FOR A PARTICULAR PURPOSE AND MERCHANTABILITY. IN ADDITION, FONTHEAD DESIGN DOES NOT MAKE ANY REPRESENTATIONS REGARDING THE USE OR THE RESULTS OF THE USE OF THE SOFTWARE OR THE WRITTEN MATERIALS IN TERMS OF CORRECTNESS, ACCURACY, RELIABILITY, CURRENTNESS OR OTHERWISE. THE ENTIRE RISK AS A RESULT OF THE PERFORMANCE OF THE SOFTWARE IS ASSUMED BY THE USER. Foro was designed in 2012 to be a slab serif with an appealing flow, warm, and less harsh than many slab serifs. It evinces an attachment to humanistic shapes, models and proportions. Foro’s demonstrated strength render it excellent for texts, and its clear and distinct details are an advantage in display sizes. 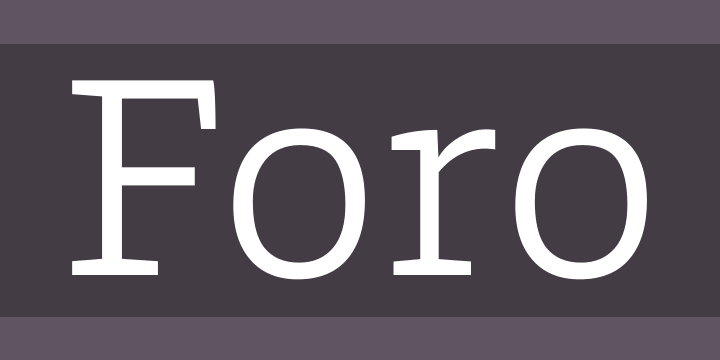 Foro comes in 16 styles and in OpenType format. All weights contain standard ligatures, proportional lining figures, tabular lining figures, proportional old style figures, lining old style figures, matching currency symbols, fraction- and scientific numerals and arrows. Foro supports Western European, Central and Eastern European languages.